Make sure you check expiration dates before you buy. Don’t pick the items from the front; those usually have the shortest expiration dates. Reach way back in the shelf. I realize some store clerks don’t like this, one pointed out there is no difference in reaching way back. The stores usually keep the earlier expiration dates in front, so I reached to the back of the shelf anyway. These deals won’t last. Last year I waited until after Thanksgiving, thinking the low prices would continue. But I found out that inventory gets really low after Thanksgiving, and prices go back to normal levels. This time, I am not waiting around. If I had more space, I’d have picked up more. After shopping around for bulk survival food https://apartmentprepper.wordpress.com/2010/11/04/survival-food-shopping/ and storage materials, https://apartmentprepper.wordpress.com/2010/11/13/items-needed-for-storing-survival-food/ I am finally ready to start storing. Food items such as rice, pasta, pinto beans, etc. 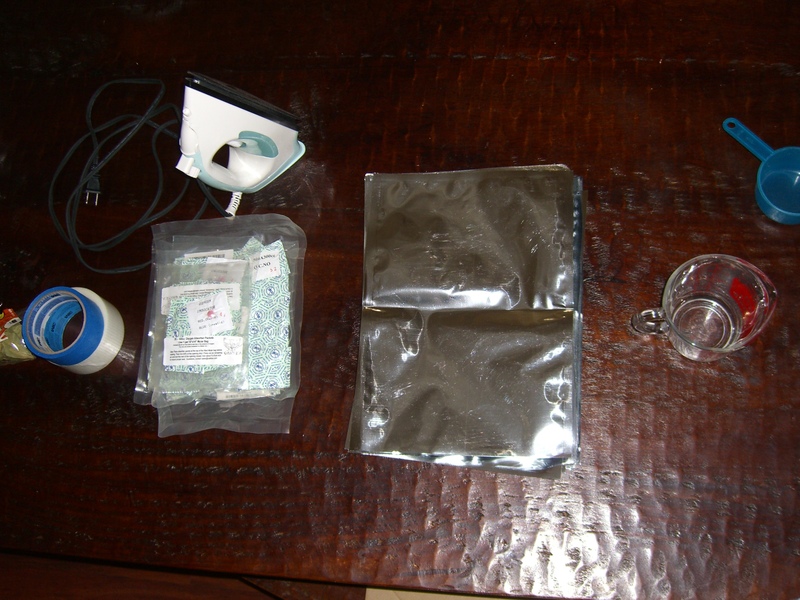 The photo shows the mylar bags, oxygen absorbers, masking tape and jar. A few things to note: Before you start, set the iron to the hottest setting. Make sure you set the iron on a covered surface to avoid burning. I used recycled cardboard from a large pizza box, but you should determine what works best for you. While these steps are doable with one person, it is easier to do them with two people, so you have someone holding the bag while the other person is ironing across. My husband helped me out on this so it went a bit faster. You will need to set aside a solid block of time to do this: Oxygen absorbers start activating as soon as you open the package. If you have to stop and leave them for later, you must store them in an airtight container or they will become useless. DO NOT use oxygen absorbers for storing sugar. This will cause the sugar to harden into a block. Place one oxygen absorber in the bottom of the mylar bag. Pour 12 cups of rice (or whatever you are storing) into the bag. I used a 2 cup measuring cup to as this was quicker than doing it one by one. Add another oxygen absorber and one bay leaf on top of the rice. There should be about an inch clearance from the top edge of the bag to where the rice fills up to. Line up the sides and across the top of the mylar bag flat. Carefully iron across the top, leaving a 1 inch space open on the left corner. Don’t worry, the iron will not stick to the mylar, it actually stays smooth. Do not try to make a fold across the top and iron it: we tried this and it does not seal as well. “Burp” the bag to let any remaining air out. Now you can iron the remaining space and seal it up. Careful, as the iron can get too hot. 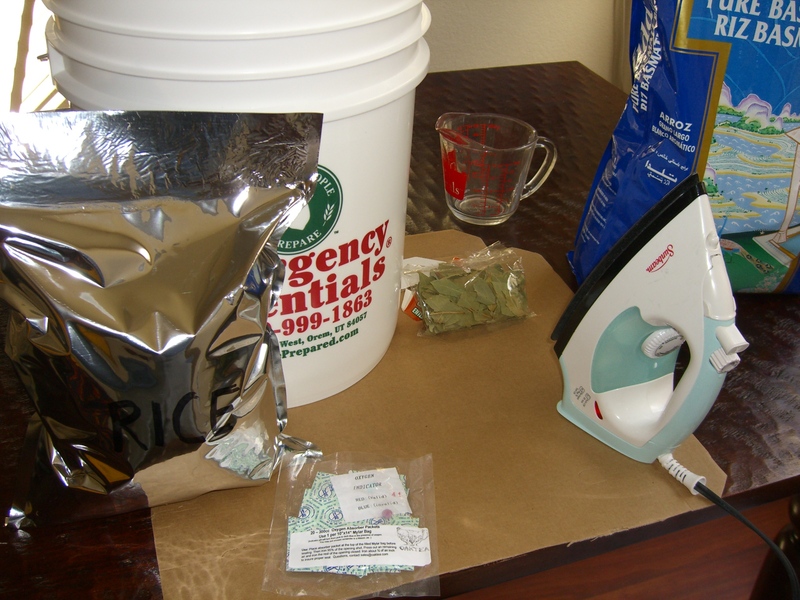 About an hour after we started, we noticed the bags were not sealing as well, then we realized the iron had gotten too hot and the automatic shut off activated. Make sure your iron does not overheat. Label the bag with a sharpie pen. Place the mylar bag in the food grade 5 gallon bucket. Keep packaging the same food item into mylar bags following the above steps until the bucket is full. Label the bucket. I used a masking tape and wrote the contents of the bucket with a sharpie market. Store any remaining oxygen absorbers in an airtight jar. Store the bucket in a cool, dry area. I cannot store food in the garage as we live in a hot and humid area. Heat and humidity will shorten the life of stored food. For now, the buckets are hidden under the dining table with a long table cloth. The next day, you will notice the bags look shrunken. This is the oxygen absorber doing its job. That’s it, the process was actually easier than I thought. I am happy to be back home after being away for a week. Now I can proceed with my bulk food storage plans. Last week, I posted about shopping for food staples such as rice, pasta, pinto beans, etc. in “Survival Food Shopping” https://apartmentprepper.wordpress.com/2010/11/04/survival-food-shopping/. One gallon bags of staples are easier to transport than five gallon bags. Since we live in an apartment, there is always a chance we may have to bug out. If we had to leave on foot with only the bug out bags, we would be able to carry one gallon bags of food between family members. Since the goal is to keep the food fresh for as long as possible, if we open up the five gallon bag, we would need to use it all up. 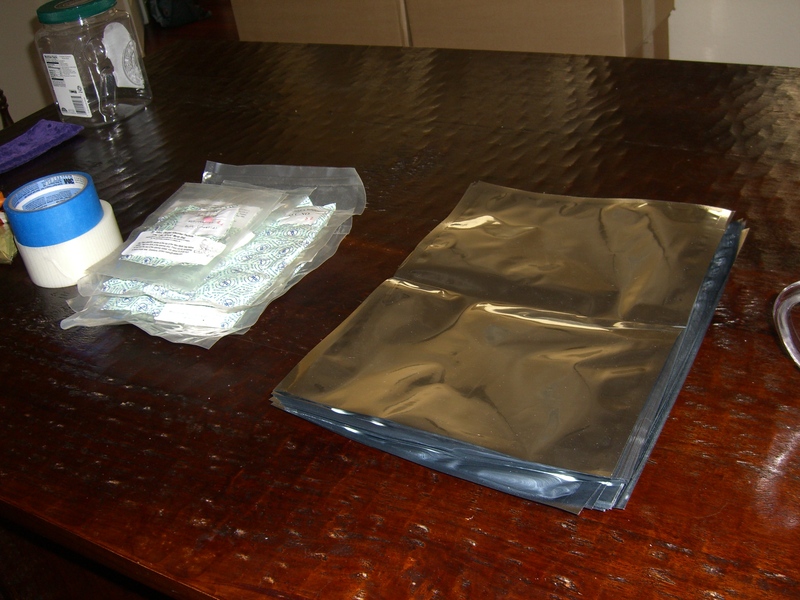 Since we are storing in one gallon bags, they can be opened and used as needed, without affecting the rest of the batches. If we choose to, we can share one gallon bags of food with others in need, such as family or neighbors, without compromising the rest of the bin. Here are a few of the materials I have collected. 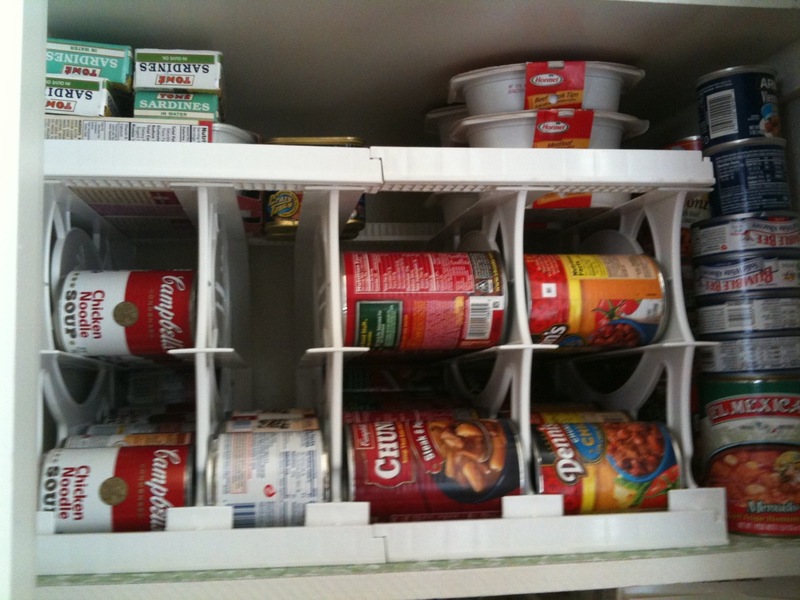 On my next post, I will go over the steps that I am doing to store the bulk food items. This month’s project is to store some bulk items such as rice, flour, pinto beans, sugar etc. I was originally hoping to participate with the local Latter Day Saints (LDS) Cannery that I had found out about after doing a search for mylar bags and bulk food storage. I called them and found out information and pricing. The facility is about an hour away, but it sounded good so I planned to go as the prices were very reasonable. You don’t have to part of their church to participate, but you do need to be “assigned” to partner with a church group to do bulk storage. Unfortunately, the week I was all set to go, I called ahead and found out they were having major construction and was not accepting any appointments in the near future. They also did not have an estimate for when the work would be completed so it was back to the drawing board for me. My husband and I decided we will shop for the bulk items wherever we can find a good deal. We do not belong to a warehouse club; the membership fee is too steep for me for number of times we shop and items that we need, but that is for another post. This past weekend we visited a couple of ethnic groceries and found good deals on many of the items on the list. We found out about these stores by chatting with people at work about where to find good deals on groceries. The Mediterranean store had excellent prices on rice and pasta. They also had great prices on spices, honey, vegetable and olive oil. These items were not on the “bulk grain” shopping list but they were too good to pass up. We also checked out a Hispanic market and they had good prices on flour, sugar, pinto beans and legumes. Now all we need to do is repackage the foods into mylar bags and 5 gallon buckets. I will post about that adventure as soon as I get all the packaging materials together. I happily won ModernSurvivalOnline.com’s Cansolidator Giveaway a couple of weeks ago. 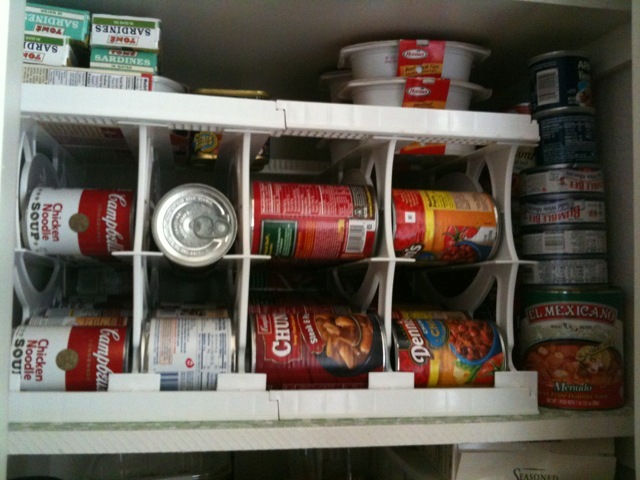 The item is the Cansolidator “Pantry” which fits 40 cans and is available from Shelf Reliance (http://www.shelfreliance.com/food-rotation-systems). I’m not a paid sponsor, just reviewing the item since I have never used a food rotation item before. As you know, I am always on the hunt for an efficient way to store our supplies, since we are always so short on space in our apartment. We finally decided on a spot to place it and were ready to assemble the Cansolidator. The instructions are pretty simple and I was starting to assemble it when my son got interested and decided he would do the assembly. I was happy to oblige, as this gave me time to empty out the designated pantry shelf. I actually found a few cans of chicken stock in the back that I had forgotten about. 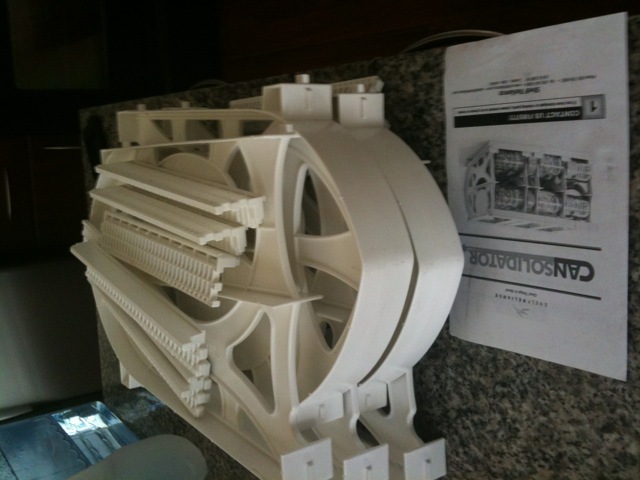 Here is the way it looked getting assembled on the floor. 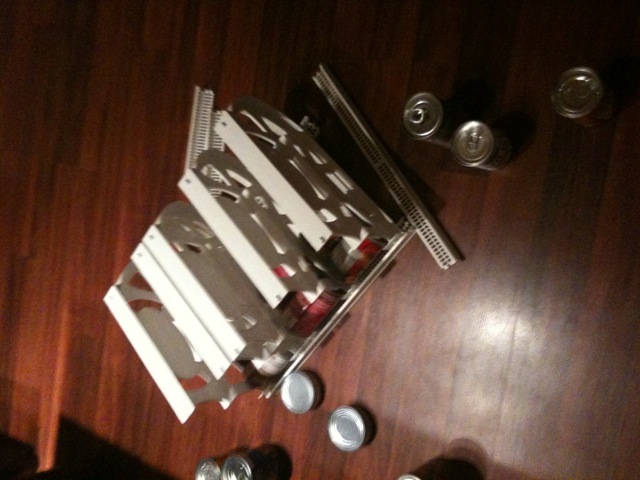 We started inserting canned goods into the Cansolidator and enjoyed seeing the cans slide down the path. We then emptied it out and tried moving it to the shelf and found that… it didn’t fit! Oh no! By now my husband was home and wanted to know what we were fussing about. He measured the shelf and found it should all fit, it just needs to be assembled INSIDE the shelf instead of outside. So they took it apart again and re-assembled. We still had a few cans left over so we stored them in the corner of the shelf. 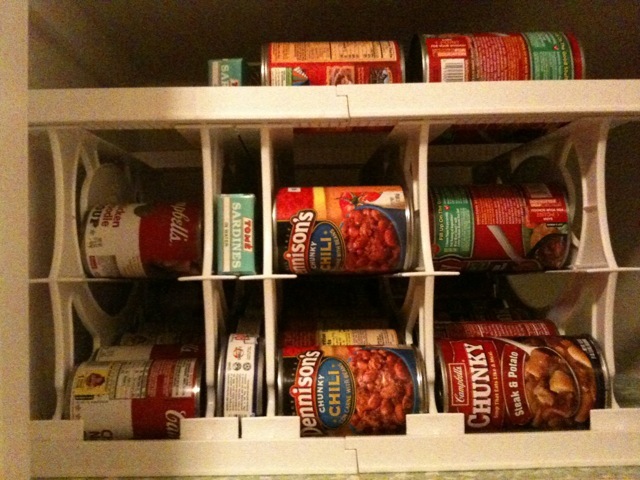 Overall, the Cansolidator is a good item for organizing your pantry shelf. I originally had the mistaken notion that it is a space saver. It is not so much a space saver as it is a shelf organizer. We checked the expiration dates and positioned the items with the closer expiration dates so it is in front of the shelf. As far as the number of cans it can fit, it actually fit the same number of cans as when the cans were stacked on top of each other. However, because you can see more of what you have, it will help avoid waste. It performs well as intended: a food rotation system. I found a few cans were close to expiration, so this makes me aware that they need to be used soon. Measure your space before assembly, or you will find out the hard way, as we did. Assemble the Cansolidator in the space it will be housed in. What shall we do to deal with this? We wanted to increase our food storage for staples such as rice, beans and sugar while prices are still fairly reasonable and not out of control. We checked out the food storage stores online and there are some deals, but the budget is limited. I did some calculations and figured it would be cheaper to buy in bulk and pack it ourselves. So this week we are going to try our hand at “do it yourself” long-term food storage. We will buy rice, beans and sugar in bulk and purchase five gallon buckets, mylar bags, oxygen absorbers, for storage. Once I’ve actually done it, I will post about the process in a later article. One of the recent comments on one of my postings, from Madmax808 (thanks! ), mentioned stocking up on Spam-the canned meat kind, which got me thinking about it so I picked up a couple of cans that were on sale. For anyone who has never tried Spam, it is a canned meat by Hormel, made of pork shoulder and ham. It looks like a pink brick when you first take it out of the can. A lot of people hate it, but there are a great number of fans out there. My parents actually introduced me to Spam. Since they were kids during World War II, they grew up eating Spam as a special treat. Meat was scarce back then so having a little meat, even from a can, was a good thing. My Mom made me Spam and cheese sandwiches with mayonnaise on white bread up until high school when I got too “grown up” to bring Mom’s lunches to school. When our family visited Hawaii a few years ago, we found fast food places like McDonald’s actually served Spam, egg and rice for breakfast. Not sure if they still do, but we tried it and it was pretty good. Here is the quick recipe: Slice Spam into thin slices. Fry in a bit of oil until browned and sprinkle sugar on top. Serve with scrambled eggs and white rice. Or, make a breakfast sandwich with Spam, a fried egg and American cheese between two pieces of sliced bread. There are lots more ways to cook Spam, but these are my favorites. This is not a paid endorsement and I have no connection to Hormel. I am always on the lookout for inexpensive foods with have a good shelf life that the family likes. I think Spam is a worthy addition to the larder, as it is actually pretty tasty if you cook it the right way.